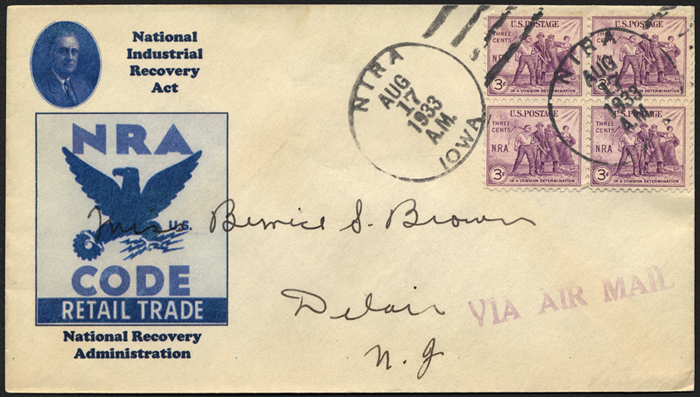 National Industrial Recovery Act, National Recovery Administration. [S.l. : s.n., . A nation returns to prosperity : a first day cover from Washington, D.C. [Washington, D.C. : Capitol Stamp and Cover Service, . The Tennessee Valley Authority. [Washington, D.C.? : U.S. Government Printing Office, 1935]. The development of the Tennessee Valley. [Washington, D.C.? : U.S. Government Printing Office, c1936]. Pamphlet back cover.Welcome to the Japan pavilion. Golden Gate International Exposition(1939-1940. San Francisco, Calif. The political Struwwelpeter / by Harold Begbie ; illustrated by F. Carruthers Gould. - London : Grant Richards, 1899. Lost in blunderland : the further adventures of Clara / by Caroline Lewis ; with fifty illustrations by S.R. - London : William Heinemann, 1903 (London & Edinburgh : Ballantyne, Hanson & Co.). Fibel für die evangelischen Volksschulen Württembergs / mit Bildern von P.J. Schober, K. Sigrist und H. Sohn. - Stuttgart ; Berlin ; Leipzig : Union Deutsche Verlagsgesellschaft, 1933. The world at home ABC : an alphabet of nations / by W. Gibbons. - London ; Edinburgh ; New York : Thomas Nelson and Sons, [ca 1900]. Warships / compiled by workers of the Writers’ Program of the Work Projects Administration in the Commonwealth of Pennsylvania. Chicago: Albert Whitman & Co., 1940. Book, dust jacket spread. The land of little rain : a story of Hopi Indian children /written and illustrated by Muriel H. Fellows. ; Chicago : The John C. Winston Company, c1936. Book cover spread. The land of little rain : a story of Hopi Indian children /written and illustrated by Muriel H. Fellows. ; Chicago : The John C. Winston Company, c1936. The registration of aliens by Hon. Vito Marcantonio ; with an introduction by Carey McWilliams.New York. American Committee for Protection of Foreign Born,1940. I am a fugitive from a Georgia chain gang!, by Robert E. Burns ; with an introduction by the Rev. Vincent G. Burns.New York : Grosset & Dunlap, Publishers, c1932. A pictorial parade of Texas : Attend the Texas centennial celebrations, 1936. [Dallas? : Texas Centennial Commission of Control, 1936?]. Timur and his gang /[c]Arkady Gaidar ; translated by Zona Voynow ; illustrated by Zhenya Gay. [a]New York :[b]Charles Scribner's Sons,[c]1943. Buy American! (and good times will come thru') / words by Al Lewis ; music by Al Sherman. [New York : De Sylva, Brown and Henderson, Inc.,c1933]. [Front lining paper and flyleaf]. Comrade Gulliver : an illustrated account of travel into that strange country the United States of America / Hugo Gellert. New York : G.P. Putnam's Sons, c1935. [Back lining paper and flyleaf]. Comrade Gulliver : an illustrated account of travel into that strange country the United States of America / Hugo Gellert. New York : G.P. Putnam's Sons, c1935.